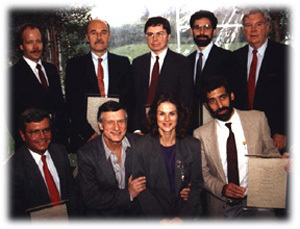 1988 Hugh M. Hefner First Amendment Award winners with Hugh M. and Christie Hefner. Print Journalism recipient, David Arnett, is shown far left, back row. 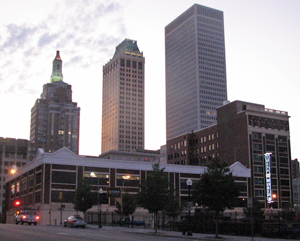 Analysis: National journalists from PolitiFact, the Tampa Bay Times and Poynter are in Tulsa meeting with those who greatly doubt them. Admittedly it was a difficult meeting Tuesday night, but it is clear to friends and foes worldwide that journalism, as we know it, has failed America. Sadly Hugh M. Hefner passed to his final reward Wednesday, but he would have loved the meeting at the Republican Party of Tulsa County offices. Beyond his hedonism; Hefner promoted the First Amendment and established a foundation with annual awards. I am the 1988 winner of the Hugh M. Hefner First Amendment Award in Print Journalism and Hefner was one reason why I established TulsaToday.com in 1996. Well, that and because the daily newspaper fails so frequently to cover conservatives. Atlanta born St. Petersburg based Poynter Journalist Daniel Funke is traveling with PolitiFact editors and reporters as they visit Tulsa to connect with the daily Tulsa World, and Scripts Broadcasting’s KJRH locally to promote upcoming coverage, they say, with accurate fact-checking of Oklahoma politicians. Not really knowing anything of the local area they reached out to the Republican Party of Tulsa County. 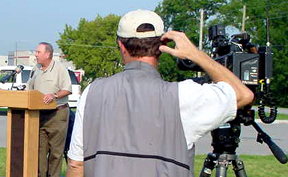 The resulting story can be found online by clicking here. The piece begins with a password for the GOP office Wi-Fi Funke thought memorable, but easily understandable to most of the GOP “Reagan2016. Capital R, no dashes.” It’s been changed now. I am also the Communications Chairman of the County Republican Party and Publisher of www.TulsaToday.com earning a living more from consulting than media. I effort to disclose when writing on any topic I am involved with personally or politically. Media doesn’t often mention other media – it’s a competition thing. They each want reader or viewer to think they are the only place for journalism. Is that a fact to check? It could be a failure of comprehensive coverage. Of course Funke did not cover all that was said at Tuesday’s gathering. Did he cover all the most important parts of the discussion? Did we solve all issues facing America in general or journalism in particular? Not even close. I am quoted questioning the editorial judgement of the daily newspaper, but in more comprehensive review. I respect them in many ways, have friends that work there and hope in all ways that they will improve. I said that at the meeting, but was it noted in the story? Not really, but maybe in some ways. Readers should know that two reporters attending the same meeting often walk away to file vastly different stories. It is a human perspective thing and a competition or agenda thing and too often lately in coverage it appears as a partisan thing. I asked the seven other Republicans at the meeting to summarize their perspectives for the record and for discussion at the October Republican County Committee meeting (near 100 precinct chair and vice chairs attend). These are my mine. 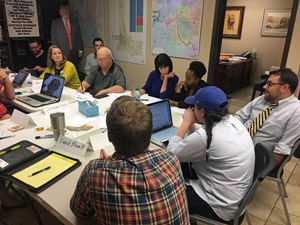 To their credit, Randy Krehbiel writing for The Tulsa World covered the recently elected Republican County Chairman David McLain (click here for that report) and local Republicans appreciate that coverage. McLain attended the meeting with PolitiFact, but asked for much of his comments to be “off the record.” Funke respected that request so much so that McLain wasn’t mentioned. Others attending thought that a shame, because McLain spoke with powerful and insightful comments generally on bringing people together and avoiding division in public discussions. KTUL Channel 8 covers local politics well and recently called to ask for a spokesman from the Republican Party of Tulsa County to answer why four elected Oklahoma Republicans have recently resigned in disgrace from office. How would you answer that question? The story may be found online here. I did the best I could on camera. KTUL did not include my comments that at least Republicans resign when discovered. Democrats in Oklahoma continue to serve until hauled out of office (see former-Sen. Gene Stipe’s public record for more detail). 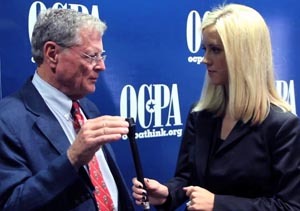 Senator Inhofe interviewed by OCPA. 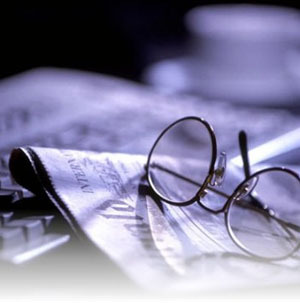 News or activism? But while Tulsans talk nationally to media on politics in coverage on and off the record, Oklahoma Council of Public Affairs (OCPA) executive Brandon Dutcher feels empowered to tweet, “Tulsa World liberals teaming up with PolitiFact liberals for ‘independent fact-checking.’ Dutcher then tags @TulsaCounty GOP and a disgraced Tulsa blogger proven to publish factual errors. This OKC based conservative think tank is respected by many, but what business is it of theirs who meets with whom to check facts in a free society? As a writer, I have long “sandbagged” some of my best ideas. I want you to buy the book. However, I asserted passionately at Tuesday’s meeting that a lack of ideology diversity in the newsroom is killing journalism. To recover honor, it is clear media must abandon their most beloved myth that journalists can be nonpartisan and dispassionate which I assert is impossible in these deeply divided days. To provide balanced coverage you must balance the ideology of both news writing and editorial staff. Not helping conservative writers in any way is national conservative pundit and former presidential candidate Mike Huckabee. He once passionately declared on national television to “never, ever trust a writer.” He talked about how conservatives were betrayed by writers deliberately twisting facts. Thanks Mike, conservative writers are greatly offended by that statement and we hold it against you. Conservative writers at Tulsa Today have been engaged in honest coverage of news and opinion for twenty-one years and you are not helping sir. 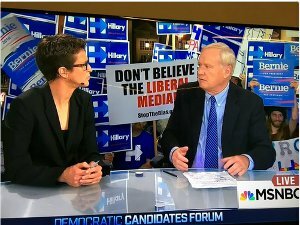 Conservatives don’t get good media coverage because conservatives don’t own media and they do not populate the ranks of media management. 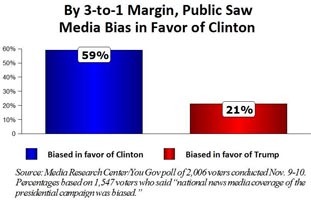 Media doesn’t hire conservatives because of the myth of “nonpartisan dispassionate” journalists. Ellerbach once to me asserted that as a badge of honor the Tulsa World doesn’t ask a potential reporter if they are of the left or right. I failed then, as I remember now, to articulate clearly to her that was exactly my point. They need to ask, have reporters declare at which altars they worship, then be responsible in not assigning reporters to coverage contrary to their passions. I admire Ellerbach’s skill demonstrated over decades, but reporters go from journalism school to small media and hope to work their way up to bigger markets – print or broadcast. They have usually never held a job outside media and the thought of risking their own capital in any business venture is alien to them. To advance up any chain of authority it is best to support your superiors thus Liberalism enshrined is rarely challenged. Further, it is easier to write compelling copy on those that need help than it is to write about how someone needs to own responsibility for their circumstances. I believe Hugh M. Hefner would have loved this debate. His daughter Christie in 1988 was shocked that a Republican won one of the awards and, in fact, they don’t communicate with me much anymore. It’s ok. The award and photo hang in my office and memories of the mansion and it’s private zoo bring a smile. 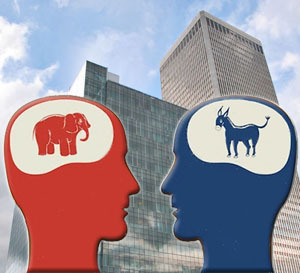 The great divide left and right will never be healed in America until we find common ground to write and speak without restraint in vibrant debate. This is what the Republican Party of Tulsa County did with PolitiFact and Poynter and we hope to do with all media. We must fix this “failure to communicate” (1967, Cool Hand Luke). All of good heart should hope so for our universal common ground – the future. This entry was posted in Business, National on September 28, 2017 by admin.